Okay, so you know how Instagram has that feature where you can save posts to a little private folder only you can see? Well, I just so happen to take mine very seriously. 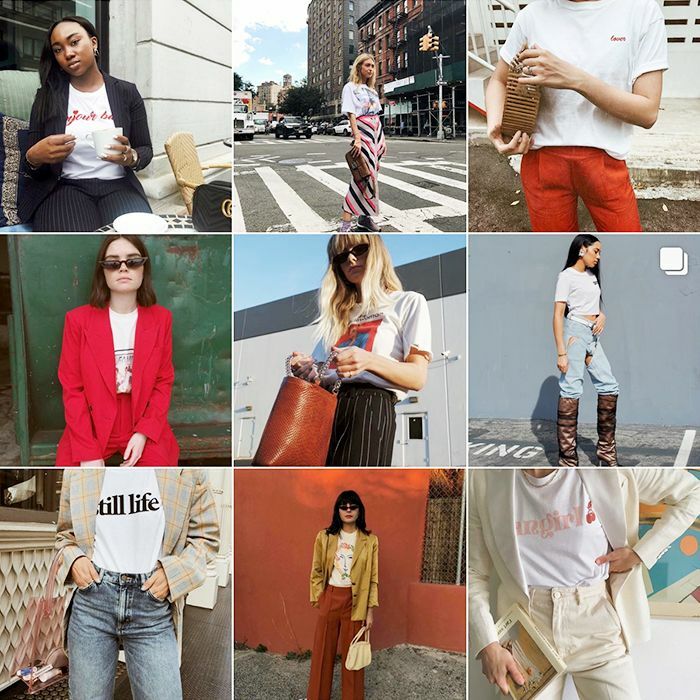 I use it to test how aesthetically pleasing my personal taste is, to keep track of shots I want to re-create for my own personal feed, and, of course, to stow away outfit ideas I need to copy. Recently, I noticed that my saved folder had a plethora of cool T-shirt outfits, and I thought to myself, who doesn't love a cool T-shirt outfit moment? That brings us here, to this story. Below, you'll see the small collection of T-shirt outfits I currently have saved on Instagram. Between the bloggers, brands, and street style photographers I follow, I think it's safe to say this is a well-rounded assortment. And in case you aren't loving your T-shirt drawer at the moment, I shopped out the freshest tees on the market, some of which I already own and some that are on my ever-growing wish list. Because after you lay eyes on the looks ahead, you'll feel inspired to utilize your tees in ways you've never dreamed of before. Not only do I love every aspect of this look, but I also love the angle at which the photo was shot. Saving it to remember for future content. Equally obsessed with the message as I am the colors. Taking simple stripes to a whole new level. A subtle way to display your happiness. Basically, anything Emili Sindlev wears, I want to also wear. Your newest street style staple. For all of the grandmas around the world. The easiest way to make jeans and a tee look cool? An oversize blazer. Appreciate every woman in your life with this tee's fun take on a shopping bag motif. Available in Italian sizes 34 to 44. For your obligatory Instagram photo op. Not sure if I love this picture because Y/Project jeans are involved or because I loved any top that's cropped. Another Balenciaga look to love. Nnenna's belt bag game is so strong, and so is the rest of this look. The laid-back California style we all know and love is here to stay. This arcade-esque artwork is everything I'm loving right now. This might be the coolest way to incorporate a band tee into a look yet. Another Instagram angle I wish to re-create. "Millennial Peach" is here, so get used to it. This loose, boxy tee is our favorite shade of pink right now. Reese is the queen of making her ever-growing T-shirt collection look elevated. Here's one picture of many to prove it. Eighties babies, this one's for you. Earth tones for the win. When you have to let everyone at the gym know fashion is always more important, opt for this tee. Wear your art on your sleeve (or your shirt). Double Trouble Gang is actually one of my favorite T-shirt brands. Its products are simple but get a lovely message across. Declare yourself a heartbreaker in this cute white tee. Anything that involves a hoodie, I am honestly down for. Skater-chic is definitely a thing, as proven by this long-sleeve neon tee. Hopefully you're leaving here reinspired to create something insanely cool with the contents of your T-shirt drawer. If you happen to take a picture of said looks, be sure to tag me on Instagram so I can save them for future reference.